From the outside looking in, Saint had it made. He was making 7 figures, flying around the world doing what he loved most. By all accounts, he had created the life of his dreams. Best of all he had a loving wife and a 2-year-old son who he truly adored. And Yet his gut was telling him that he was off track. He knew something was off but had no idea what or why. Saint joined my first ayahuasca mastermind back in 2012, hoping that ayahuasca and The mastermind support would provide the perspective and insights he sought. 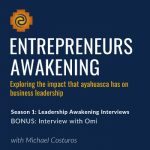 To his surprise, his first night with ayahuasca was, quote, “the worst experience of my life.” It left him feeling shell shocked and with no discernable insights. Little did HE know that that night was the first step on an epic journey that would utterly transform every aspect of his life, for the better, forever. Only now, six years later has the journey that started that night come to completion. In this interview, Saint shares how to turn a mid-life crisis into a mid-life awakening and how to source power from your truth to stay the course even when everyone believes you are crazy. P.S. We Have a few spots left in the men’s Spring 2019 Amazon Ayahuasca Mastermind. If you want to experience a quantum leap, click here to access your invitation and apply. 3:55 Saint shares how great his life was leading up to his awakening. 9:06 Saint realizes that he was living a life that others expected of him, not the one true to his nature. 12:56 Why when living a double standard and believing that you are protecting others from being hurt you are only cheating yourself and your loved ones. 16:04 Motorboat vs sailboat metaphor to illustrate the difference between living in a flow state vs living a forced life. 26:52 Why it’s a mistake to try to make meaning from your ayahuasca experience rather than observe what unfolds after. 32:28 Saint makes his first congruent decision – to leave Peru early and go home to his wife and son. Saint describes the 6-year process of realignment which includes divorcing his wife, moving to LA from NYC, falling in love and choosing a new career direction. It culminates with his now former wife joining him and his new life partner for Thanksgiving and Christmas this year. Impressive especially considering that the divorce was not amicable. Saint explains how he divorced his wife and re-aligned his life and all the while kept his heart open to her and owning the impact of his actions. As a result, 6 years later, they are friends and solid co-parents. 46:00 Saint reflects on how that one ayahuasca night opened the psychological and emotional space he needed to be able to initiate and complete his life realignment with integrity. 49:00 We discuss the difference between the impact of smoked DMT and ayahuasca. 50:27 Saint describes what changed in his professional life as a result of his awakening. Saint talks about his new creative focus – intimate love story portraits for some of the most influential names in business and entertainment. He goes deep into the new intentions behind his photography and how he sees these new type of lover portraits having a positive impact on the world.